Halibut just might be my favorite fish (sorry Salmon). For me, there is not a better fish to get when you are looking for a thick cut with great flavor that cooks easily. I was introduced to halibut when I was younger and my Dad went to Alaska on a fishing trip and brought back a bunch of fresh fish they caught. Of course, I didn’t know any better and swore I didn’t like fish at the time. Even so, when my Mom cooked those halibut steaks up, I decided to give them a try and I’m glad I did. They were delicious (good work Mom). She just lightly battered the thick cut steaks and fried them up – super simple and delicious. 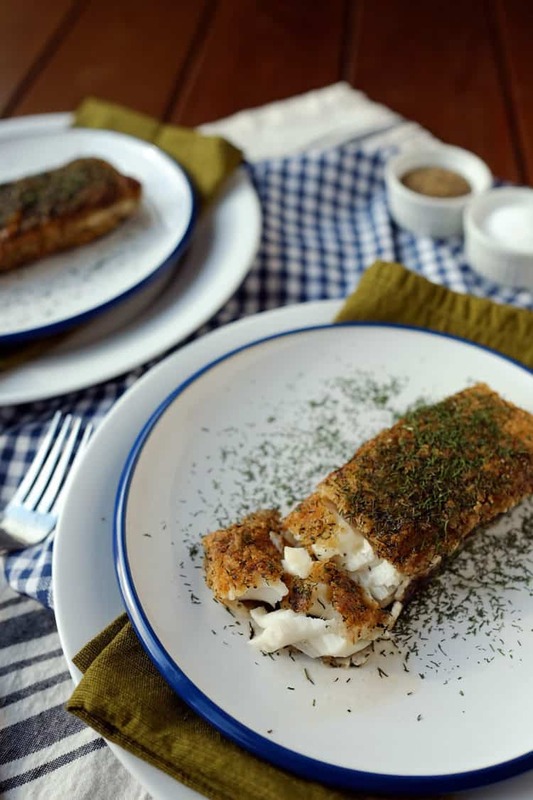 This recipe is inspired by that fresh Alaska halibut I reluctantly tried that day as a kid. 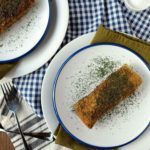 Buttery and flavorful, I just used some tapioca flour mixed with dill, salt and pepper to give the fish a light coating and pan-fried it in some butter. It only takes a minute to mix up the flour and spices to coat the halibut with. It gets messy, but you aren’t afraid of a little flour are you? Once the halibut is coated evenly with flour, just melt some butter in your pan and cook it on each side for 6-7 minutes to develop a nice crust. 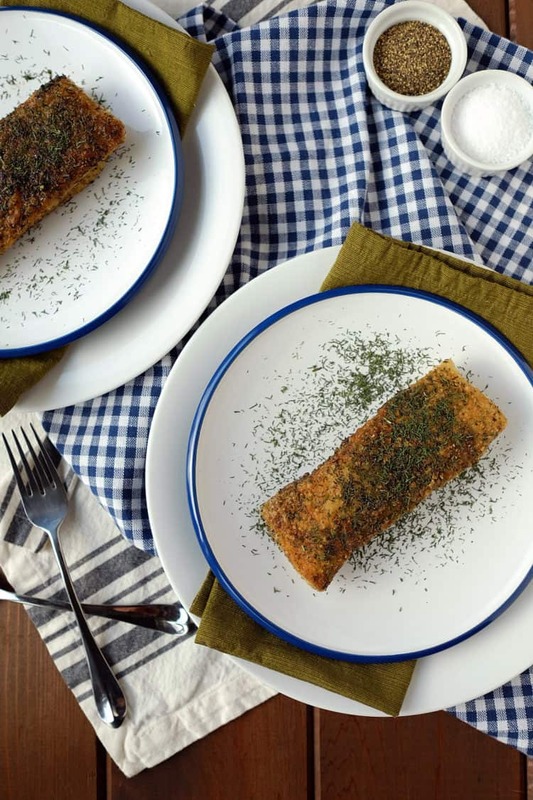 The fish will turn out flaky, flavorful and delicious. We paired this buttery dill fried halibut with a side of garlicky sautéed mushrooms and asparagus, and you can’t go wrong with that. First, prepare your flour coating mixture by mixing the flour, dill and salt & pepper together on a plate. 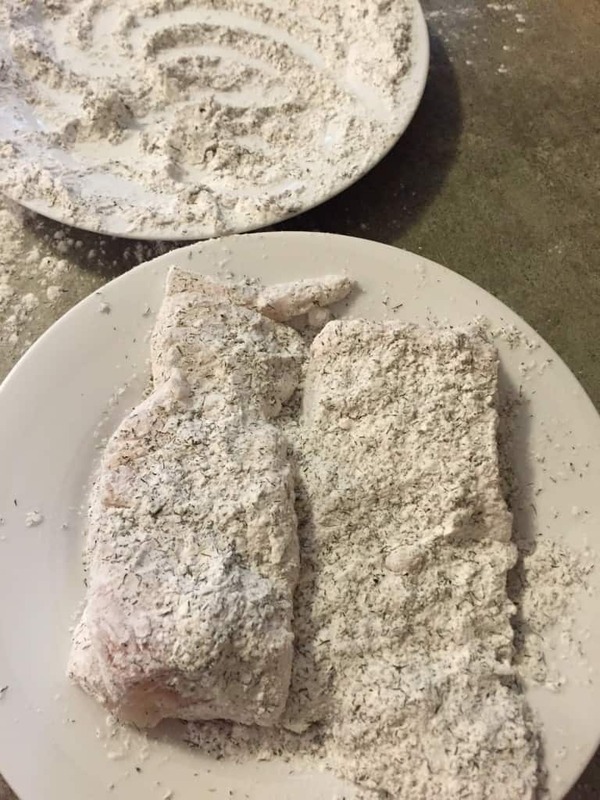 Dredge the halibut through the flour mixture, coating evenly on both sides. Next, place a frying pan over medium high heat. Let the pan heat up and then drop in the butter to melt. Once the butter has melted, gently place the fish into the pan to fry. Let the fish cook about 6 minutes, until it develops a good brown crust on the bottom (depending on the heat of your stove and the thickness of the halibut, adjust this time accordingly but flip it before it starts to blacken too much). Flip the fish over to cook on the other side until it is completely cooked through. Remove the fish from the pan and serve with whatever side you'd like. Try it with our garlicky sautéed mushrooms and asparagus for a perfect meal.